The AD9630 is a monolithic Buffer Amplifier that utilizes a patented, innovative, closed-loop design technique to achieve exceptional gain accuracy, wide bandwidth, and low distortion. Slew rate limiting has been overcome as indicated by the 1200 V/s slew rate; this improvement allows the user greater flexibility in wideband and pulse applications. The second har- monic distortion terms for an Analog input Tone of 4.3 MHz and 20 MHz are 80 dBc and 66 dBc, respectively. Clearly, the AD9630 establishes a new standard by combining out- standing dc and dynamic performance in one part. The large signal bandwidth, low distortion over frequency, and drive capabilities of the AD9630 make the Buffer an ideal Flash ADC driver. The AD9630 provides better signal fidelity than many of the Flash ADCs that it has been designed to drive. Other applications that require increased current drive at unity voltage gain (such as cable driving) benefit from the AD9630s performance. The AD9630 is available in plastic DIP (N) and SOIC (R). By Analog Devices, Inc. This is one package pinout of AD9630,If you need more pinouts please download AD9630's pdf datasheet. 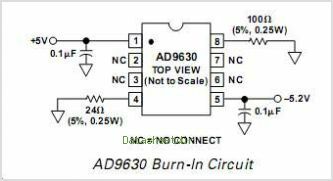 This is one application circuit of AD9630,If you need more circuits,please download AD9630's pdf datasheet.